Alaskans love Hawaii. At least, my wife and I sure do. Winters in Alaska can be long, and my wife gets to missing sunny weather. 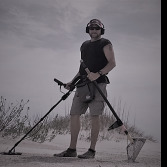 I miss metal detecting for half the year! So a mid-winter break in the beautiful islands of Hawaii is a much welcome respite from the cold weather. I’ve been to Hawaii before and done well there with my metal detectors. I usually focus on detecting in the water, and my machine of choice after using many brands and models is the White’s Surf PI Pro. Hawaii has some of the worst conditions you can throw at a metal detector, with extremely mineralized volcanic rocks and salt water combining to make water detecting there tough indeed. Most any machine works well on the white sands, but when you get into sand mixed with volcanic rock every detector I’ve ever tried wants to generate false signals. The Surf PI is not immune to this false signaling on volcanic rocks, but it has so far offered me the best combination of power and ease of operation (and price!) 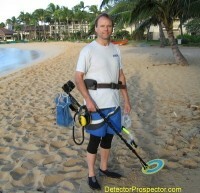 of all the detectors I have tried for saltwater detecting in Hawaii. And so it was the machine I planned on using the most on this trip. Then White’s introduced the new Matrix M6 model, and I received one just before my departure to Hawaii. I like having two detectors for trips like this since a detector failure of any sort can be disappointing without a backup. It just so happened I wanted to try looking for small jewelry items like chains and earrings in the drier beach sands and it seemed the Matrix M6 would fit the bill nicely. I already have an extensive background with the closest relative of the M6 – the White’s MXT. The MXT has very good sensitivity to small gold items, and I own lots of accessory coils for the MXT. I was certain the 14 kHz M6 would share in the small gold capabilities of the MXT, and so it seemed a perfect opportunity to try out the new model. I packed the machine up, along with the 6” Shooter DD and 10” elliptical DD Eclipse coils made by White’s. I have commented before on the features of the M6 and so will stick to how it worked in the field for this report. I decided to use the M6 initially with the 10” elliptical DD coil, which I felt would provide good depth and smooth operation on a saltwater beach. My hunting grounds were the drier sands above the active wave zone. The sand is wet below the surface, but not literally running with saltwater. I am a big believer in pulse induction machines like the Surf PI Pro for wet salt sands and so did not bother doing any detecting in the water with the Matrix M6. Playing in the surf is a lot safer with a totally waterproof detector anyway. The first thing I did was experiment with the sensitivity settings and ground tracking. I was pleased to find that the M6 ran just fine in the normal track or fixed modes at high sensitivity levels, and that I did not have to resort to using the “Beach” mode unless I went down onto the wet sand below the surf line. The Beach setting is designed to allow a single frequency machine like the M6 to operate in wet salt sand without false signaling, but it usually comes at a cost of sensitivity on small gold targets. The Beach setting did allow the M6 to run quiet as can be in the wet salt sand, but when I got up above the surf line it was not needed. I was able to run as high as a sensitivity of “10” with the DD coil and the M6 ran quiet as can be. Only when I set the sensitivity up into the cross-hatched “redline” area above a setting of 10 did I start getting a bit of low level falsing from the sand. Even then the machine worked just fine, and it was a decision between running “maxed out” and a bit noisy or at a still very high sensitivity level but with quiet operation. I did spend hours doing both and ultimately came to the decision that the whole point of the M6 was to have a nice, quiet operating detector. One of the selling points of the M6 is quiet operation and so I think turning that sensitivity control up to where the machine just starts to generate a bit of noise and then backing off is in line with its intended design goals and operation. I have always been a fan of leaving my detectors at a fixed ground balance setting, as opposed to running them in track mode all the time. Automatic ground balancing is a great thing, and those that want to be on the safe side should just leave a detector in automatic at all times. But I think I get better response with less fading on small or very deep targets with a fixed ground balance setting, and less shifting of VDI numbers on found targets. So I like to let the tracking run a minute or two and then switch to the “Fixed” or “Off” position. This is what I did on the M6, and so ended up at a sensitivity of 10 and in the “Lock Off” position on the Auto Trac control. For beach detecting setting the discrimination control was easy. I set it to the far left so that all targets would respond. I generally dig it all on beaches, only passing on iron targets at some beaches if there is enough junk to warrant it. But with a new detector digging it all is a good idea anyway to learn the machine and its responses. Besides, I really wanted to see how the new seven tone audio worked on the M6, and so going by tones only seemed like a good idea. This left the final setting. The trigger switch on the Matrix M6 causes the detector to operate as a standard single tone detector in the default center position, or in a seven tone audio mode in the forward locked position. You can run in either mode and toggle to the other to check found targets both ways. Squeezing the trigger activates the pinpoint/depth reading mode. For dig it all beach hunting I might as well have just set the M6 for a single tone, but I wanted to learn the tones and see how the machine responded in the multi-tone mode and so set the trigger switch forward. So to sum up, sensitivity at 10, discriminate at far left (off), and trigger forward for seven tone audio. Set the tracking on for about a minute of operation over clean ground and then switch to off. In reality it only takes a few seconds for the tracking to find the proper ground balance level. If you are unsure of ground balancing and what it does, leave the tracking on. It does not get much easier than this! I could make this long story even longer and go on at length about my detecting. The fact is I spent most of my detecting time with the Surf PI Pro, as I have learned the best finds will usually be made in the water. But I did use the Matrix M6 a lot and I dug hundreds of targets over many hours of detecting. I like to dig everything initially to learn about how a detector reacts to different targets, so I dug the good along with the bad. I was focusing on small signals, and so dug countless little bits of foil and other small pieces of aluminum. I dug pull tabs and bottle caps. I dug a bunch of junk, and I dug up over a hundred coins. And I finally dug a diamond earring and a diamond ring! The only problem is the diamond earring turned out not to be real. The 14K white gold diamond ring was the real thing and a nice find indeed. Even the earring was a great find however, a testament to the ability of the White’s Matrix M6 to find small items on a beach or elsewhere. And so here are my observations gleaned from all this detecting and digging. First, the M6 is an excellent beach detector. It worked well and at high sensitivity levels with no need to resort to the beach setting unless the sand was actually dripping wet. I was hitting coins at 8” or more with ease. I was unable to do direct comparisons but I will not be surprised if the M6 turns out to be one of the better single frequency beach detectors. It will no doubt be bettered by some multi-frequency or pulse induction detectors, but it did an excellent job in my opinion. The sensitivity to small items is superb, as my digging of small aluminum proved, along with the backings off a couple of earring posts, which are very small items. The signal on my little fake diamond earring post was strong and loud at a couple inches. Do expect to give up some of this sensitivity if using the beach mode in wet salt sand, however. Compared to my trusty MXT it is my feeling that the Matrix M6 gets the same depth you get from the MXT in target id modes. I also think the MXT gets extra depth and sensitivity in the threshold based all-metal modes, like the Prospecting Mode, or the mixed mode Relic Mode if you are listening for the less obvious all-metal signals. But the fact is that most people do not dig everything using threshold based all-metal modes. I think many hunters will like the silent operation of the Matrix M6 and the performance it offers for most types of coin and jewelry detecting. I also think extreme performance people like nugget hunters or relic hunters will be advised to spend the extra $100 for the MXT and its extra versatility. In practice it tends to boil down to high, medium, and low, but the extra tones add extra ability to discern what you are likely digging without referring to the meter. The tones work better than the meter, or at least they did under these tough detecting conditions. I used both the 10” elliptical DD Eclipse and 6” elliptical DD Eclipse “Shooter” coil. The 6” coil hit tiny items a bit better than the 10” DD coil, but overall the 10” coil seemed the better coil for me. It covered ground better and still had more than enough sensitivity to small items. The fake diamond earring post was found with the 10” coil. The 6” Shooter was able to run all the way up into the cross-hatched max sensitivity area and still run dead quiet, however. If you want the best sensitivity possible to small items and clean running in bad ground, use the Shooter coil. 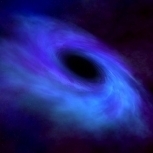 The M6 may be one of the more powerful yet easy to operate detectors ever designed. I think a person might be well advised to simply go with the “listen-to-it-all” concept behind multi-tone detecting when using the White’s Matrix M6. The idea is to hear all targets, and hunt strictly by ear. Targets are never “masked” or ignored due to discrimination settings, and a decision to dig is made based on how the target sounds. A meter is almost extraneous to this kind of hunting, and in fact a good way to learn how to hunt this way is to tape over the meter and force yourself to hunt by the sounds alone. If you go with this theory of detecting, then tuning the M6 becomes the simplest task you can imagine on a detector. The discriminate control stays at the far left. Only in extreme iron conditions might you turn it up, and many would advise even then it be left off. If the machine seems noisy from too many signals lower the volume level on your headphones so that the sounds become a threshold of sort. Then just listen to the sounds and dig items until you begin to have a feel for what sounds “good” and what does not. Moving slow and a small coil will help in trashy locations. The M6 is very forgiving on sweep speeds. For those who do not like the tones, there is the single tone mode. Using this mode is extremely simple. Just set the discrimination control to the level you wish, and dig whatever beeps. If you want more ability to discern targets in the single tone mode you will have to rely on the meter. One thing I did note is that small targets gave a more solid hit in single tone mode than multi-tone mode, and so it a person was trying to use the M6 for nugget detecting or any other “push it to the edge” detecting of small items I think the single tone mode may offer a slight advantage. But this may be more a perception thing than reality as the same items signal in both modes. They just sound a tad better in single tone mode to my ear. I use lots of different detecting strategies depending on what I am looking for, the amount of time available, and yes, my mood at the time. I do think that for the best performance “listen to it all” tone detecting offers the best ability to discern good targets from bad with the least chance of targets being masked by discrimination settings. A gutsy move would be for someone to make a machine like the M6 without a discrimination control or meter. My suggestion is that the Matrix M6 be used as if this were the case. Key switch forward (seven tone), discrimination to zero, and forget the meter. Just listen to the tones and dig what sounds good. But you can use other strategies with the M6, like cranking the discrimination control all the way to max. This is a good setting for those times when my patience with digging trash is at a minimum, as about the only things that will signal at this setting is a coin. Let's wrap this up. In summary I think the White’s Matrix M6 offers top end performance in about the simplest to operate form possible. The detector will not outperform detectors costing hundreds of dollars more, nor do I think it was intended to. I do think White’s has succeeded in offering MXT level discrimination performance but with more tones and quiet operation to those who were wishing for it. Considering the price, the performance, and the incredible coil selection, the White’s Matrix M6 is worth serious consideration. It offers solid performance and simple operation at a very reasonable price.